The Mazawattee Tea Company began as a small family business, but grew exponentially when the youngest son John Lane took over. Lane understood the importance of advertising, paying for many posters, leaflets and even enamel signs to be distributed around the country. He negotiated an agreement with railway companies, ensuring that posters appeared in eye-catching places on station platforms. By 1895 the firm was trading from an enormous building on Tower Hill. 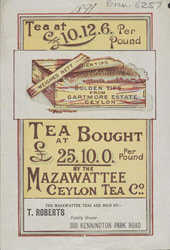 The company was renowned for the grand functions held there: of course, tea was always on the menu.